ANN ARBOR — Fuel economy of new vehicles sold in the U.S. last month fell 0.1 mpg to 25.0 mpg, the lowest mark this year, say researchers at the University of Michigan Transportation Research Institute. 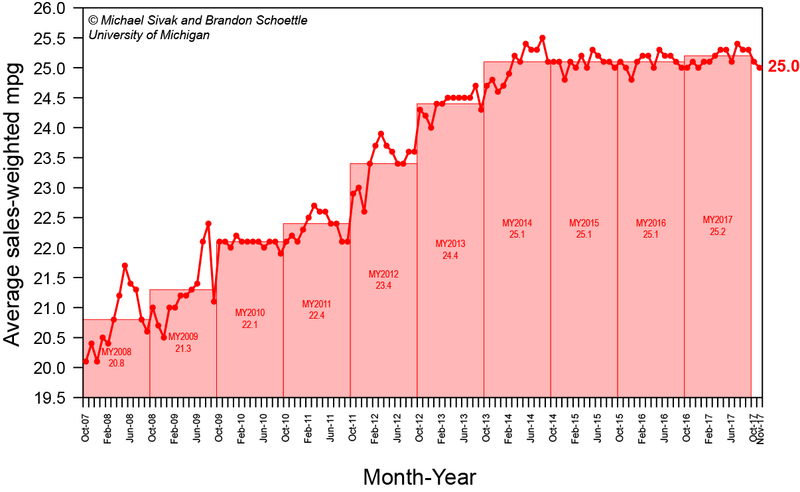 The value for November is up 4.9 mpg since October 2007, the first full month of monitoring by UMTRI researchers Michael Sivak and Brandon Schoettle, but still down 0.5 mpg from the peak of 25.5 mpg reached in August 2014. In addition to average fuel economy, Sivak and Schoettle issued a monthly update of their national Eco-Driving Index, which estimates the average monthly emissions generated by an individual U.S. driver. The EDI takes into account both the fuel used per distance driven and the amount of driving — the latter relying on data that are published with a two-month lag. The lower the number, the better the figure for emissions reduction. During September, the EDI worsened to 0.83, up from 0.82 the month before. The index currently shows emissions of greenhouse gases per driver of newly purchased vehicles are down 17 percent, overall, since October 2007, but 5 percentage points higher than the record low reached in November 2013. To view related research, visit www.umich.edu/~umtriswt/publications.html.